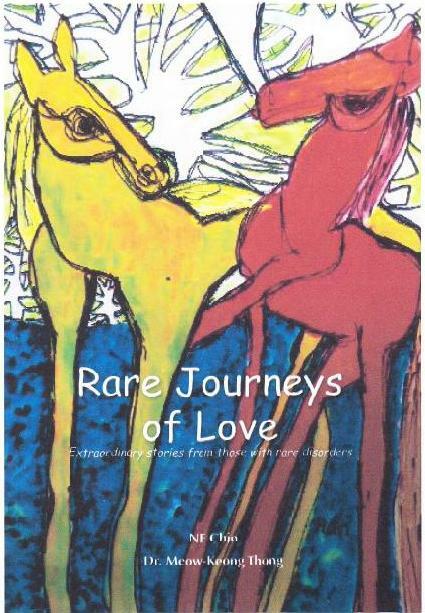 Malaysian Rare Disorders Society is pleased to announce the publication of their first book entitled “Rare Journeys of Love”. The book presents 10 true stories of Malaysians living with rare disorders. The book will be available for sale in March 2011. If you are interested in purchasing this book, please e-mail to us at info@mrds.org.my or call us at 019-7714543. The book can also be posted to you. Please give us your name, address, contact number, e-mail address (if any) and payment of RM25 (RM20 book + RM5 postage within Malaysia) by cheque or postal order made out to ‘Persatuan Penyakit Jarang Jumpa Malaysia’ and mail it to 16, Lorong 5/10D, 46000 Petaling Jaya, Selangor. If you want the book to be posted to you outside Malaysia, please e-mail to us for the postal charges. The book weights about 230g. “Duchenne Muscular Dystrophy, ‘brittle bone’ disease, Achondroplasia, Ectodermal Dysplasia, Prader-Willi Syndrome. Strange sounding words but these are actually names of rare disorders affecting some of our fellow Malaysians. A rare disorder is a medical disorder that affects a small number of people and is caused by genetic or environmental factors or by unknown factors. About 3% to 5% of babies are born with serious birth defects. It is estimated that there are about 20,000 babies born each year with birth defects in Malaysia. Some of these babies have known rare disorders. Rare Journeys of Love presents 10 extraordinary stories of Malaysian families living with rare disorders. These are heart-warming stories shared by parents of children diagnosed with rare disorders or by patients themselves. Journey with them as they describe how they face the daily challenges of living with rare disorders – with tears, fears and much love.